Whenever I feel flummoxed about fixing food, I go look at new recipes. That is all it takes to get inspired to create something new and fall in love with being in the kitchen again. You as the mom and homemaker are the pillar of health in the home, as G.K. Chesterton once said. You have the power to control your family’s moods and the destiny of their health by what foods you allow in your cupboards and refrigerator. Wow, what an amazing stewardship and promise! How do we begin? The first shopping list here is from Heather Dessinger, over at mommypotamus.com. I highly trust her opinion. She was able to reverse her autoimmune disorder that left her infertile, chronically exhausted, with anxiety, acne and acid reflux. She healed all these conditions by following a real food, Weston A. Price diet. The second shopping list, over here, comes from Katie over at wellnessmama.com. She also follows a Weston A. Price diet. Her list includes some coupon codes to help you save money when ordering some of these items online. OK, now let’s get cooking, shall we? This is my recipe for whole wheat sourdough bread made in a breadmachine. It’s so yummy! Did you know that bread made with commercial yeast is hard to digest? Even supposedly healthy whole wheat bread. Many people with gluten intolerances have been able to eat bread with natural yeast, which is simply flour and water that are allowed to ferment. This natural yeast is how our ancestors ate their bread generations ago. The grains are much more digestible when made with natural yeast, which predigests the starches and neutralizes the phytic acid in the grain. Mommypotaumus’ recipes are here. These and wellnessmama’s below are all Weston A. Price diet-based. No refined sugar or flour here! Wellnessmama’s are here. All of these recipes are grain-free and kid-approved! This picture comes from Sarah Pope’s blog (link below). 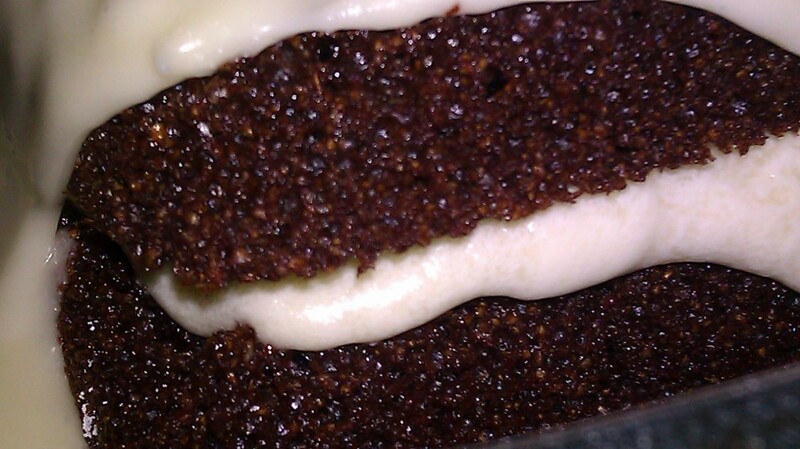 It is her awesome Devil’s Food Cake that is entirely wholesome with real foods (soaked whole wheat flour, nutrient-loaded butter frosting, sucanat, and coconut oil.) It’s under the “snacks and treats” tab if you click on the link in the next paragraph. Sarah Pope over at the http://www.thehealthyhomeeconomist.com/recipes/ has recipes based on Nourishing Traditions principles. Watch all the videos on her site, you will learn how to prepare foods in the traditional ways of our ancestors to give you improved health. You can also check out her videos at her YouTube channel here. http://nourishingfamilies.blogspot.com/ this is the site of my homeschooling mom friend Tammie who wrote a cookbook called Scratch. It’s full of delicious recipes that are made from scratch with whole foods (except for canola oil, that is not a whole food!). She has a gluten free section in the book. She also has some companion booklets that feature recipes involving more gluten-free baking, smoothies, quinoa, and essential oils. You can order the cookbooks at her site and also get a few recipes from the book. They are not Weston A. Price diet based, but these recipes are a great find for those transitioning from processed food. http://happyinthekitchen-with-tara.blogspot.com is by my friend Tara, another homeschooling mom. She has recipes based on Nourishing Traditions principles as well. My nutrition mentor Caralee who is a Weston Price chapter leader, like Sarah Pope, has her blog here. http://amodernpioneeringfamily.blogspot.com/2010_07_01_archive.html She has a great recipe for soaked whole wheat bread dough that Sally Fallon approved, it’s on the bottom of the page. If you are into crockpot cooking, go here. It has recipes so you never repeat a dinner for a whole year, all from a crockpot.